University of Wisconsin students delivered doors to legislators at the Capitol Thursday in protest of tuition increases proposed by Gov. Jim Doyle’s 2005-07 biennial state budget. 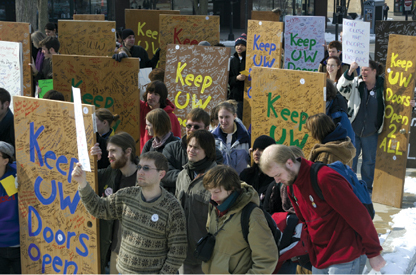 Student members from various UW System schools lobbied for a tuition freeze, or to limit increases to at least 3 percent. “We want to get that tuition number lower, right now we want to push to limit increases to 3 percent and then fight to [preserve] financial aid,” said United Council Legislative Affairs Director Renee Stieve. The student protesters swarmed underneath the Capitol dome chanting and banging on the doors while others hung banners from the second-floor balcony. During the protest, legislators curiously looked down from upper balconies but kept their distance. After a portion of the crowd moved on to chant and bang on doors outside the governor’s office, the Capitol teemed with students preparing to meet with Joint Finance Committee members. In an effort to appease student demand, State Rep. Rob Kreibich, R-Eau Claire, who spoke at the rally, proposed a bill to limit increases to 3 percent. “Your presence here today will send a powerful message to Legislature and the governor that no longer are we going to balance budgets on the backs of students,” Kreibich, chair of the Committee on Colleges and Universities, told the crowd. Students responded with roaring ovation. While many students were satisfied with a possible 3-percent cap on increases, some still believe a tuition freeze should be the ultimate goal. Despite varied opinion on the specific goal of limiting tuition increases, everyone attending the rally, including United Council representative Austin Evans, agreed there is still a long way to go. “Today was a good day, we had a chance to meet with members of the Joint Finance Committee which is a good step, [but] it doesn’t stop with today,” Evans said.